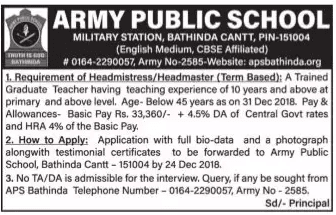 Army Public School, Military Station, Bathinda Cantt has recently given a notification of 01 Headmistress/ Headmaster Vacancy on the term basis. You can apply for the APS Bathinda Cantt. Recruitment 2018 on or before 24.12.2018. Name of Department: Army Public School, Bathinda Cantt. Last Date: 24 December 2018. Army Public School Bathinda Cantt. Recruitment 2018-19 latest notification is out. As per the Notification, there is 01 Headmistress/ Headmaster Vacancy. The educational qualification is the TGT with experience. The maximum age limit is 45 years. If you are looking for Teaching Jobs in Bathinda then this article is going to be very helpful for you. A Trained Graduate Teacher having teaching experience of 10-years and above at primary and above level can apply for the post. The maximum age limit is 45 years as on 31.12.2018. Rs. 33360/- + 4.5% DA of Central Govt. Rates and HRA 4% of the Basic Pay. The selection for the Headmistress or Headmaster position is going to be on the basis of interview. You can send your application with full bio-data and a photograph along with testimonial certificates to the Army Public School, Bathinda Cantt-151004 on or before 24.12.2018. You can check the APS Bathinda Result or Interview List from the official website.